For baby boomers, who grew up in an era when space exploration offered the fascination and potential of a previous generation's westward expansion, last week's State of the Union message by President Donald Trump held a nostalgic moment. "In 2019," the president said, "we also celebrate 50 years since brave, young pilots flew a quarter of a million miles through space to plant the American flag on the face of the moon. 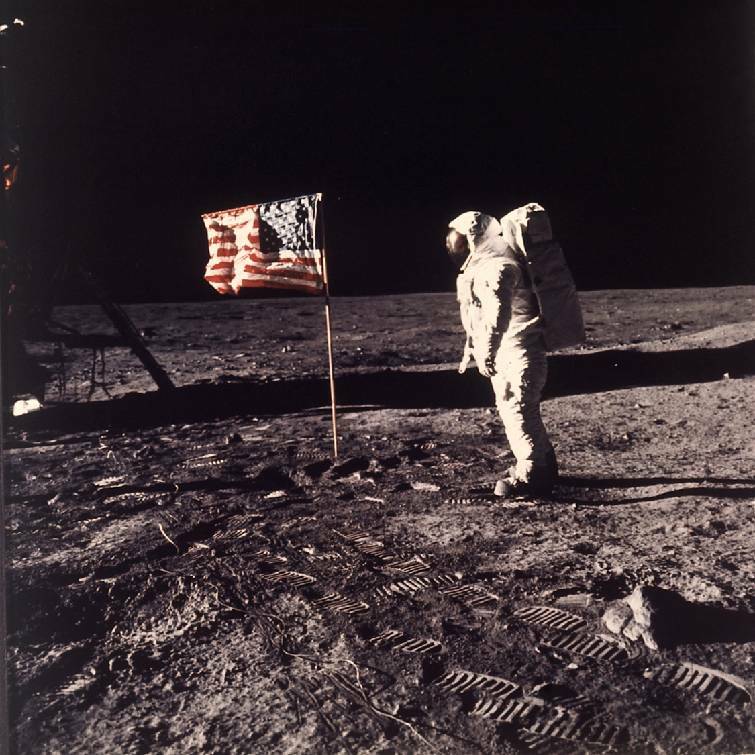 A half century later, we are joined by one of the Apollo 11 astronauts who planted that flag: Buzz Aldrin." The now white-bearded Aldrin, 89, the second man to step foot on the moon, stood in the U.S. Capitol's House chamber balcony and snapped off a smart salute to his commander in chief. The subsequent cheers for him were one of the longest of the 100-plus applause breaks of the night. "This year," Trump added, as if the following announcement might top the astronaut's appearance, "Americans will go back to space on American rockets." To some of us baby boomers, that sounded as unambitious as if he had said this year automobiles will have steering wheels. We were hoping the president would follow the introduction of Aldrin with a challenging quest that Americans would return to the moon, or to Mars, or that the Space Force he talked about creating nearly a year ago would have a formidable assignment. Trump's mention of Americans returning to space on American rockets is not momentous. Indeed, it already had been listed on the website of NASA's commercial crew. Whether it will happen this year, though, is still up in the air since the first flight of SpaceX's Demo-1 — a test flight of the system without a crew — already has been pushed back from January to March. President John F. Kennedy, just a year into the 1960s, declared the country would put a man on the moon by the end of the decade. It was both a promise and challenge since the Union of Soviet Socialist Republics (USSR) was competing with the U.S. in space. After all, a country with a communist form of government couldn't possibly outperform a government that boasted liberty and freedom, could it? It turned out the USSR could not, but that didn't keep the space race from being headline news throughout the decade. Long before cable and internet and smartphones, teachers interrupted classes to turn on boxy televisions for space launches, and scads of young boys — and perhaps some girls — declared they wanted to be astronauts when they grew up. As for Aldrin's July 1969 flight, it had been quickly preceded by Apollo 8's first manned lunar orbit flight during Christmas week in 1968, Apollo 9's manned flight test of the lunar module in March 1969 and Apollo 10's manned lunar landing "dress rehearsal" in May 1969. We remember seeing Apollo 11's fiery launch on a television rolled into a summer enrichment classroom, marveling at the lunar module's rough moon landing on a used console black and white television in a dimly lit den on a sunny Sunday afternoon and then barely staying awake for the first steps on the moon later that evening (which concluded when the astronauts closed the hatch of their craft at 1:11 on Monday morning). It was breathtaking, though, the thought that astronauts had landed on the moon and taken steps on it. And the United States had been the country to do it. Today, with our gadgets and our technology and our ability to simulate practically anything in a video game, going to the moon may not seem much like a feat of science. Many may have a feeling of been-there, done-that. Americans 50 years ago felt national pride over the technological challenge and the competition of the space race, but many today feel little stirred by the U.S. flag, national anthem or the country's accomplishments. To them, space exploration — to the moon, to Mars, or to infinity and beyond — may not seem like an expense worth repeating. So, yes, we can make American rockets, we can put astronauts in them and we can commercialize space flight — make it all one more corporate venture. However, we believe individuals and countries always need challenges, something that at first glance seems insurmountable but at second thought seems within our grasp with a little more ingenuity and hard work. It's that attitude that brought the U.S. to the point where it dared consider the moon a potential destination, and it's that attitude that still can refine our edge. We hope President Trump and his successors might dare to dream bigger in space.